So we already know Razer is entering the smartphone market, and its debut device is coming tomorrow. The device has already been spotted in a benchmark listing, and an alleged image of the phone also leaked a few weeks ago. Now, the handset has been listed on the website of a Three UK affiliate. 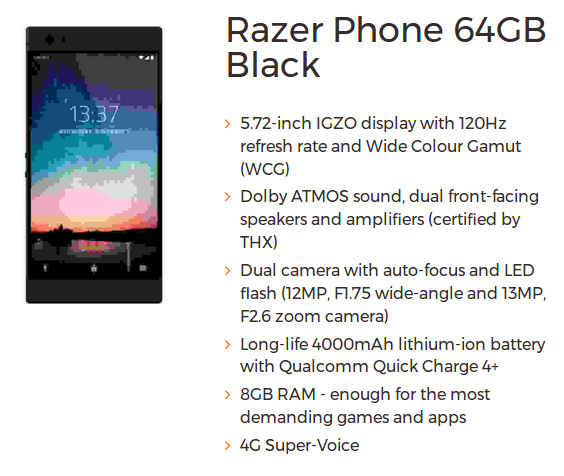 The listing not only shows the front of the Razor Phone (in low-resolution though), but also reveals some of its key specs. As per the listing, the phone sports a 5.72-inch screen and comes with 8GB of RAM. It features a dual rear-camera setup (12MP+13MP), and packs in a large, 4,000mAh battery. Other details revealed by the listing include Dolby ATMOS sound and Wide Colour Gamut (WCG) display. The device's benchmark outing had revealed some other key details, including Snapdragon 835 SoC, 64GB storage, and an 8MP selfie camera. There's, however, currently no information on the price tag the phone will carry.